West Shore Café in Lake Tahoe will be holding a unique event – Whiskey Dinner. The pairing dinner Thursday, Jan. 14 is ideal for whiskey enthusiasts and those who want to learn more about the popular spirit. The inaugural Whiskey Dinner will feature in-house bartending expert Lynn Jackson, who will be available to answer whiskey and cocktail questions. Jackson will be accompanied by Dickel and Bulleit ambassadors, who will add their expertise on tasting and profile notes. Winter travelers and foodies alike who are interested in experiences that feature interactions with chefs, other diners, spirits purveyors and regional bartenders are invited to experience new and returning events this winter at West Shore Café and Inn, located at 5160 West Lake Boulevard, Homewood. The restaurant’s signature events include the Whiskey Dinner and the second annual Local Bartender Competition. 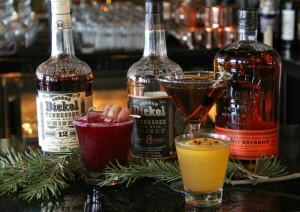 The Whiskey Dinner is a communal dining experience that will include five unique whiskey cocktails featuring Dickel and Bulleit whiskey, paired with a four-course meal prepared by resident Chef de Cuisine, Manual “Manny” Baez. Cost is $80 per person, exclusive of tax and gratuity. Guests will also have the option to add to their experience by purchasing an additional whiskey flight for $25, featuring five additional whiskey tastings. Doors will open at 6 p.m., with dinner served at 7 p.m. Advance reservations are recommended, and can be made in person at the West Shore Café or by calling 530 525-5200. The inn is also offering a lodging special that can be bundled with dinner reservations. Following the success of last year’s competition, this winter the West Shore Café will host the second annual Local Bartender Competition on Sunday, Feb. 21 from 1-5 p.m. A popular event both among local bartenders and the public judges, the competition is open and free for all local Lake Tahoe area bartenders to enter. Competitors will be judged in categories, including batch, warm and cold cocktail, and must use one of four liquors: Kettle One Vodka, Dickel Whiskey, Tanqueray Gin and Don Julio Tequila. Submissions will be accepted through Jan. 17, with the top 10 entries as judged by a panel of experts, selected and announced Jan. 24. Top 10 competitors will participate in the finals Feb. 21, with the public invited to sample and review their batch cocktails. Tickets are $10 in advance, $15 at the door, and include sampling of 10 different cocktails. Prizes will be awarded to the top three bartenders. For more information, visit WestShoreCafe.com/Bartender-Competition. To learn more, confirm reservations, or inquire about special lodging and event package rates, visit www.WestShoreCafe.com or call 530 525-5200. Jeffrey Weidel can be reached at skiweidel@gmail.com. Follow him on Twitter at @jeffweidel and visit his website at www.tahoeskiworld.com.